Daydreams of living in Paris or Hawaii are temporarily supplanted, typically on Sunday mornings, with daydreams of living in Flushing, Queens; the San Gabriel Valley; or Richmond, British Columbia. Sundays are when the dim sum jones creep to the forefront—with visions of shrimp dumplings and barbecue pork buns dancing like Astaire and Rogers—and those towns are undeniably the dim sum capitals of North America. If you live there, please know I’m seething with jealousy. As a Cantonese individual, I can say that dim sum is one of our culture’s prouder traditions. It’s the Chinese brunch equivalent of tapas, where one can point and choose from a dizzying assortment (50-plus?) of small dishes. It’s a genre of dining in which the gastronomy might be secondary to the spectacle of the proceedings—the bustle, the clamor, the cramped quarters, the collective low whirr of hundreds of Cantonese yelling over one another. “Feast of the senses” is well-trodden, but with dim sum there’s perhaps no cliché more appropriate. Over the years, I’ve gone through a number of dim sum phases. Earlier in life I was obsessed with chicken feet, which to neophytes sound repulsive, but is in essence a slurpable vehicle for chicken skin, fat, tendons, and sauce. (It’s also slippery and gooey, a food texture that Westerners find revolting but the Chinese revere.) In my teenage years I loved shiu mai, the steamed pork and shrimp dumpling ensconced in egg wrappers, and exhibit A of that delightfully springy texture we Chinese also love. But for the last few years, as I’ve grown to appreciate food not just for its taste but also on a critical and cerebral level, I’ve come to believe the most underrated and under-ordered dim sum dish is wu gok (芋角), a fried taro croquette, which when prepared correctly, is a miracle of culinary science. Wu gok, according to The Dim Sum Field Guide by Carolyn Phillips, likely originated in the Southern Chinese province of Guangxi, where the steamy climate was ideal for growing a tropical root vegetable such as taro. The way I sell it to Westerners is to imagine a deep-fried mashed potato ball stuffed with meats, except with ground taro root as the starch. With taro, it’s a fraction sweeter and vaguely nutty, like a potato that’s one-sixteenth yam. What’s unique about wu gok in the dim sum canon is you get three distinct textures in one bite. From the center outward: a chunky pork, shrimp, and mushroom filling, toothsome and tender, oozing a savory sauce that could only be articulated as tasting like Chinese. This is surrounded by a creamy mashed taro shaped like a football. Finally, there’s the exterior, which always wigs newbies out: crumbly, impossibly light fractals of fried crispiness. You rarely encounter a texture like this in Western cooking; a close analog of a wu gok exterior might be pork rinds, only more explosive in the mouth. I’m not clear on the science behind this, but when the wheat starch (the croquette’s binding agent) and taro is dropped into hot oil, the surface puffs into a crisp honeycombed lattice. Deep frying along with bamboo steaming are the two primary cooking methods for savory dim sum dishes. A Chinese kitchen’s proficiency can often be judged by the fry job of a dish such as wu gok. It’s a knacky thing to nail. Timing and temperature control ensures the croquettes maintain a greaselessness throughout. In less capable hands, the bottom becomes soggy and translucent with oil—it’s a sign the oil temperature is too low or the croquettes have sat too long before being served. It shouldn’t feel oily, and when you sink your teeth in, it should ideally emit a clean, high-toned crisp sound. 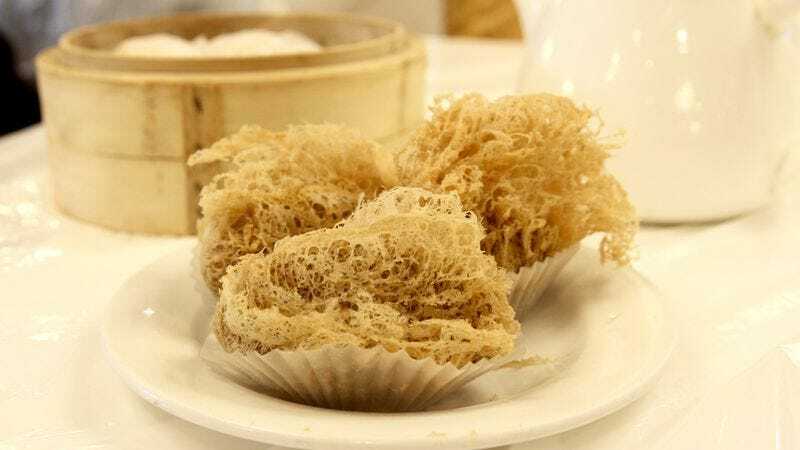 Dim sum amateurs rarely order something called “deep-fried taro dumplings” on the menu, and when they see that it resembles a bird’s nest or sea sponge, they’ll opt for the egg rolls instead. But wu gok—at least versions done right—is more rewarding, more interesting, more delicious, and makes you look like a seasoned pro at Sunday Cantonese brunch.